When I was young, I thought I’d grow up to be a doctor. But by my third year of college, it was clear I’d better stick with languages (English, Spanish, French). A course in Human Physiology erased all doubt. It was fascinating material, but my background in the sciences was just too weak. I ended up auditing that course. As a webmaster, I find myself doctoring websites for many doctors. They’re some of my favorite clients. Dr. Abe Kuruvilla is a dermatologist in private practice in Mesquite, Texas. Many of Dr. Kuruvilla’s fans would be surprised to learn that; they know him primarily as a preacher and educator. In addition to being a medical doctor, he has a doctorate in hermeneutics (the science of Bible interpretation) from the University of Aberdeen, Scotland. His website www.homiletix.com is dedicated to “fostering biblical preaching by serving as a portal for Abe Kuruvilla and his passions — exploring preaching, explaining preaching, and exemplifying preaching.” The website is the creation of a very smart web designer, whose own doctoral studies got “in the way” of maintaining the site. That’s where I stepped in! Dr. Connie Speece, DO is a second-generation osteopath in a family of doctors who provide excellent medical care to my own family. When Dr. Speece opened a laser treatment center, she engaged me to build her beautiful site, www.chrysalislasercenter.com. 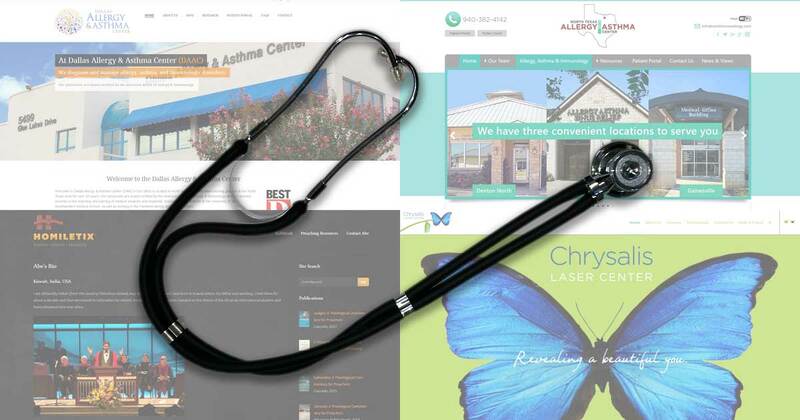 Just a few days ago, I launched the WordPress version of a website for Dr. Samuel Foster and Dr. Roshni Foster (along with their associates): www.northtexasallergy.com. As with many of my projects, this was a matter of picking up where someone else had dropped the ball. The Fosters originally engaged a nationally-known company to do the WordPress port for them, but that work bogged down under the inefficiencies of working with a large, impersonal company. I have had many pleasant conversations with Sam and Roshni as we tweaked their website to perfection. Those are some of the medical doctors I serve. I’m very happy to have several other clients with PhDs. They’re doctors too! * Just not the sort you’d want setting a broken bone. *I know a foolish young man who visited his French professor’s office and marveled that she had also studied medicine. After all, the diploma on the wall said “Doctor of Philosophy.” That young man is all grown up now.